A is definitely for Algebra, the most fascinating part of mathematics. B is for Blogging, my new hobby which I could not even dream about a year ago. C is for Conceptis (of course), my best source for my very serious addiction, puzzles. D is for Dave Green, who is responsible for Conceptis making me the puzzles. E is for Einstein, a person who I admire. 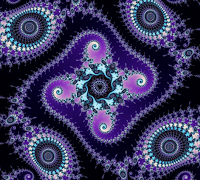 F is for fractals, recursive geometrical figures which create the most beautiful artistic images. G is for Gil, my friend and supporter in this blogging adventure. H is for hugging. Finnish people are not very keen in hugging, but I have always preferred hugging instead of shaking hands when I meet old friends. I is for Israel. The country I knew only by the news stories until last summer, when I found out that in reality it is a very beautiful and a peaceful place filled with the friendliest people one can imagine. J is for jeans. Regarding my age and work I should probably wear shirts but I have never liked them. Even stepping in to the car is so hard with a skirt. I wear jeans always when it is possible. K is for Katri, my daughter. She got her name from my grandmother. L is for the Lily of the Valley, my favourite flower. M is for Mankell, Henning. He is a Swedish novelist writing detective stories (and also about Africa but I have not read those books). N is for net, which is a big part of my life these days. O is for Olli, my son. I had no good family names when he was named and I learned much later that my grandmother Katri had a grandfather named Olli and 5 or 6 of the forefathers before that where named Olli. The first son always got his father's name. P is for Puzzles and Problems and Piitu, my 11 months old dog, who is so full of life and energy and who is very eager to learn agility. Q is for Quality, which I have learned to respect in my purchases. When I buy cheap stuff, it also gets broken so fast that I have to buy several of them to last as long as the more expensive quality product. R is for Rosa, whom I am going to meet tomorrow! S is for summer and the almost constant light we have in Finland at summertime – I am not so fond of hot weather though. T is for tile, which also is a mathematical concept. 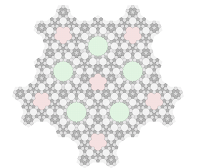 One of my favourite courses has been Tilings and Patterns. U is for unambiguous. It's a fault of mine to think that sentences can be interpreted only the way I say them. However I have found out that most people read between the lines; things I have hard to even imagine. V is for Volkswagen, my favourite car. We have had several of them in the family and even though part of them were very old, they never left us on the road. W is for Welsh Corgi, the breed of my dog Piitu. The dog that the legends tell were the carriers of fairies. X is for x, the variant in mathematical equations. Y is Yucca, a palm tree which we grow inside the house. Mu husband's name is Jukka, which is totally impossible for the English language. The pronunciation for the palm tree is the same as his name. The instructions say that each player starts with some random facts/habits about himself/herself. As you are tagged you need to post the rules and your responses on your own blog. At the end of your post, you need to choose some people to tag, list their names and, of course, leave them a comment, telling they have been tagged and they need to read your blog for more information. Please list 26 facts A-Z that people did not know about you. My blog has been a bit quiet lately. I have once again had the exam season and I am also preparing for my holiday week. I have been writing my post for a meme sent me by Jenny Mannion, but it seems to take more time than the usual ones. You will see it soon. As I wrote last time, I have been socializing in Digg and to my great fun, one video started to spread there and got quite many Diggs. Its title is Supermarket Domino and people were wondering why anyone would be able to do that; why did the boss not watch what his employees were doing and why these people had time to do this. In the beginning there is a text: "Toiset oli töissä Joulupäivänä…", which means " some people were working on Christmas Day…". Our shops were open till 1 pm on Christmas Eve and I think they were again open on the second Christmas Day. I think these people have just gotten bored at work with very few customers and finished the project after work. With a massive thing like that I would not take the risk customers ruining it. I have been socializing in Digg quite a lot lately and one of the posts that reached the front page (which is not very easy nowadays) is the following. At the moment it has 774 Diggs! Text "open" to open the door. I wonder if it'll be smart enough to realize the lav is already occupied. The comments are fun to read. This is one of the examples that people don't really know Finland. To us the whole thing was no big deal. We can pay for parking with the mobile, as well as bus fares, train tickets and so on. Also all people who can manage life on their own have mobiles. These text messages are free. In cities the use of restrooms can cost even one euro! This story is actually a short version and when I started to track it back where it started, I found out that it was published in really many places. As a result of continued and endemic vandalism, the Finnish Road Administration has developed a system which allows travellers to open the doors to roadside toilets only by sending a SMS message to the number given by the Road Administration. The new system was introduced in January in the rest areas along Highway 1 in Paimio and Salo near Turku, following numerous breakages, arson attempts, and thefts in the buildings housing public conveniences for motorists. In the rest areas of Pitkäporras (Paimio) and Haukkala (Salo), the toilets are located in neat blueish-grey maintenance buildings on both sides of the motorway. In addition to toilets, the buildings also provide showers and a place for disposing garbage. The idea for the SMS lock system was created in the Turku Region of the Finnish Road Administration. According to road maintenance expert Juha Mäki, this kind of system is not available anywhere else in Finland, nor in any other country across the world, as far anybody knows. In order to prevent further damage to the facilities, a number of ideas were discussed, including the closing down of the toilets entirely or bringing in camera surveillance. There are instructions on the doors to toilets and shower rooms, advising prospective users to send a text message "OPEN" to the number given on the door. The call is directed to a modem, which then sounds a buzzer and opens the door. The opening of the door costs just the normal SMS rate without any additional charges. The traffic centre will save the numbers of the callers for a while, but not permanently. This should somewhat raise the threshold for vandalism and reduce the damages to public property, as people will know that their phone number is down on record if they wish to trash the place. In Paimio’s Pitkäporras rest area there is also a café. Nina Backman, who serves in the café, reported that last summer the number of visitors to the toilets provided by the Finnish Road Administration was some 500 during one day alone. The travellers on long-distance coaches also find the free toilets useful. The story submitted to Digg was published in engadget, which had linked the origin of the story being switched. The stories are basically the same, but the closing comments differ. The idea is that folks will be less likely to lose their mind and graffiti up the place knowing that their mobile number is (at least temporarily) on file, but it remains to be seen if uprooters will simply take their defacing ways elsewhere or actually excrete in peace. The system will allow police to track down criminals, vandals, and those who leave the seat up. The company managing the service will keep a short term record of all users phone numbers, simply so that if the toilet is then damaged by criminals, they can be traced by the police. In this way, if someone damages the facilities, authorities have the relevant mobile numbers to follow-up. That won’t work too well if the person’s using an unregistered pay-as-you-go sim card — but generally speaking, it’s hoped that this should act as a deterrent to would-be vandals. Cool idea! You could get some rather interesting statistics from this too, couldn’t you? The next backlink is to cellular-news, which does not tell the source of the news. The text simply states the facts and has probably got it from the local news agency. If you are interested, you can read all the comments in each magazine. I had a good laugh with them! I have lately been involved in Digging and in the meantime memes keep gathering into my to-do-list. its a great way to meet new people. like many, this is a way of increase technorati and google pagerank. The best methods would be using viral links. I received this video from a friend through StumbleUpon and it is so beautiful that I just have to share it. Watch and enjoy!